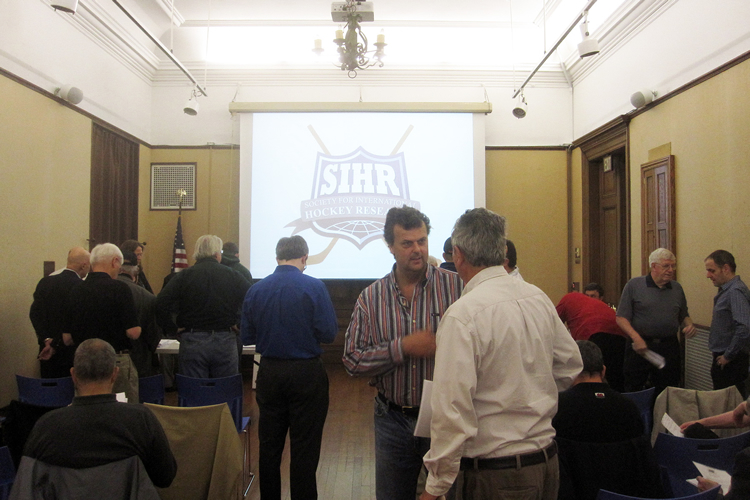 SIHR's first Annual General Meeting (AGM) outside of Canada, which was held in the perennial minor-league hockey hub of Utica, N.Y., on Saturday, May 25, yielded a record number of attendees for a Society gathering in the United States: 47 people in all, including 37 members. 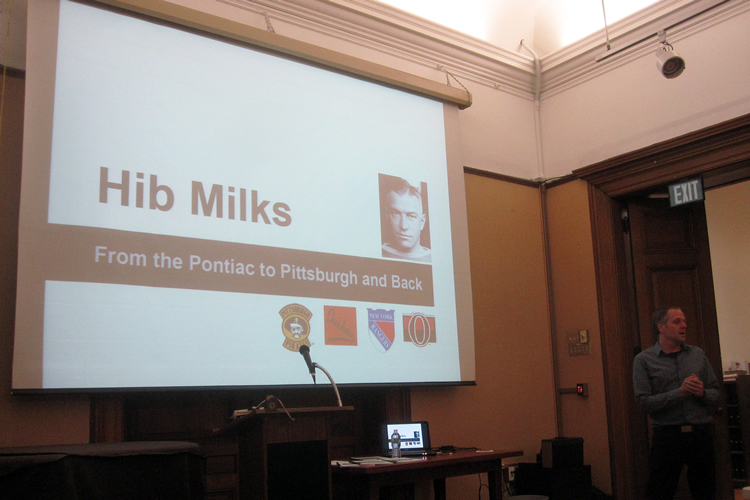 The meeting was part of several events that were planned during Memorial Day weekend (May 24-26) and those who were present enjoyed United States National Landmark venues, visits to halls of fame, a tour of the second-oldest brewery in the eastern United States, five-star local cuisine and, of course, hockey history. The grandioso Hotel Utica, a United States National Landmark that opened its doors in 1912, was the host hotel. The formal itinerary began at 3:00 p.m. on Friday, May 24, with a group tour of the F.X. Matt Brewery, sponsored by Mancuso Publishing. Founded in 1888, the facility is the oldest in New York State and was the first to serve alcoholic beverages after Prohibition was repealed in the United States in 1933. Everyone received two complimentary 16 oz. samples of their choice from a selection of beers. 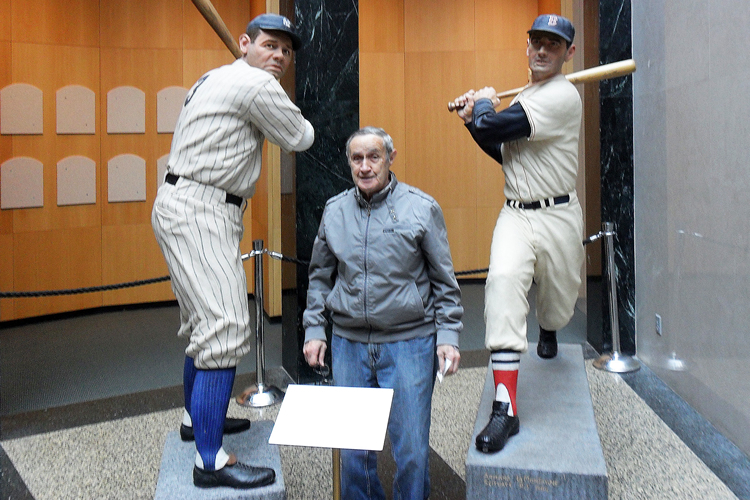 Earlier in the day, some members made a visit to the International Boxing Hall of Fame and Museum in Canastota, N.Y., and to the Utica Memorial Auditorium (where the famous pre-game brawl scene in the 1977 motion picture Slap Shot was filmed). 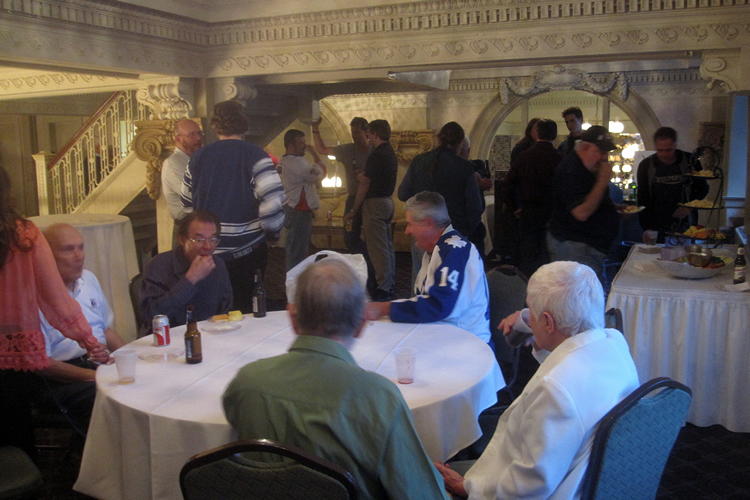 The mezzanine of the Hotel Utica, overlooking the magnificently restored lobby, was the site of Friday night's meet and greet. 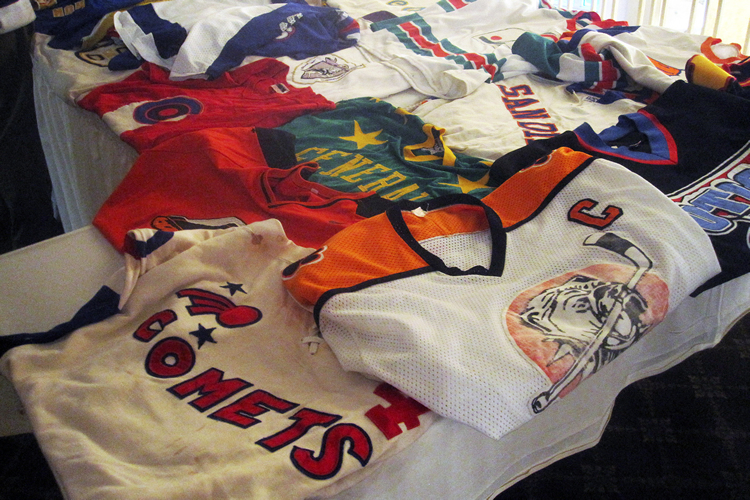 Brian Clark of Fort Mill, S.C., one of SIHR's most outstanding memorabilia collectors, had a few dozen of his awesome gameworn professional jerseys on display. 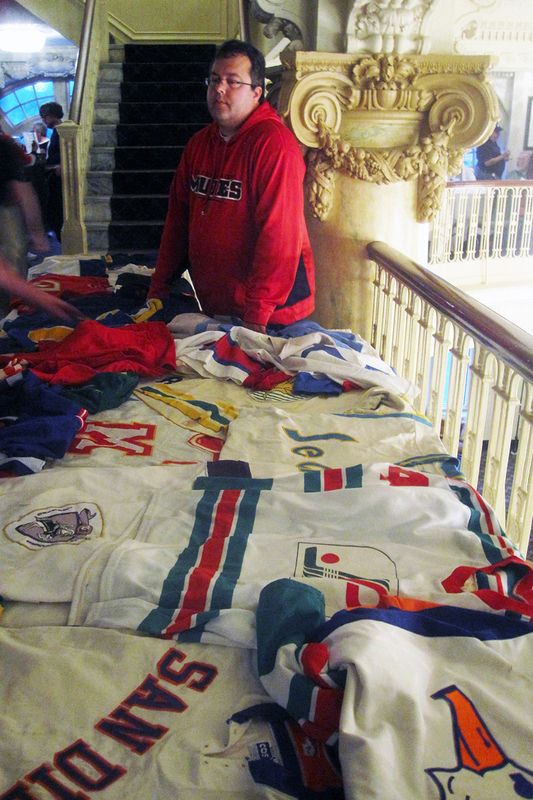 Andy Bathgate's Vancouver Blazers (WHA), Guy Charron's Kansas City Scouts (NHL) and Guyle Fielder's Salt Lake City Golden Eagles (WHL) uniforms were just a few that wowed the crowd. 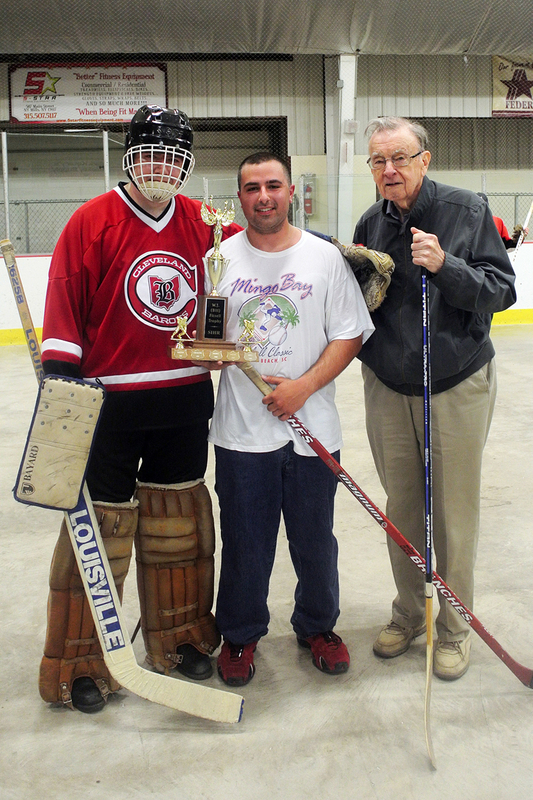 Former Clinton Comets Jack Kane, Borden Smith, Dave Armstrong and Pete Provost were on hand that evening. 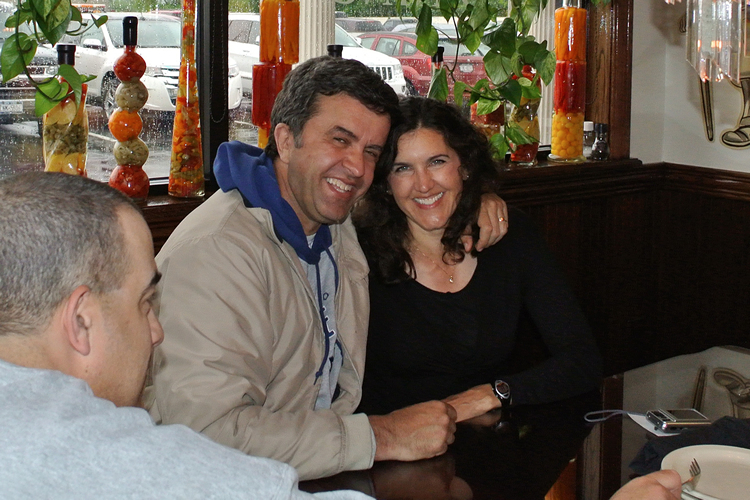 O'Scugnizzo's (established in 1914) famous "upside down" pizza was served and there was not a single slice left. Another United States National Landmark, the Utica Public Library (erected in 1904), was the site of the Saturday meeting, which went on from 8 a.m. to 5 p.m. The meeting commenced with tributes and a moment of silence for three SIHR members who had recently passed away: Don Andrews of Pembrooke, Ont. (from Ernie Fitzsimmons), Ed Sweeney of Winnipeg (from Len Kotylo) and Dr. Garth Vaughan of Windsor, N.S. 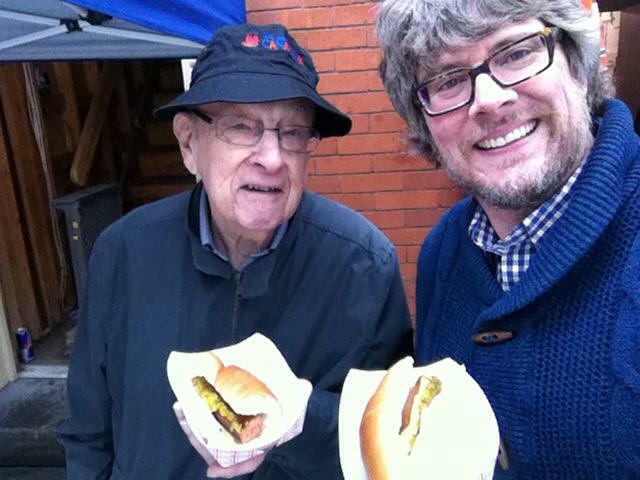 (from honorary president Bill Fitsell). 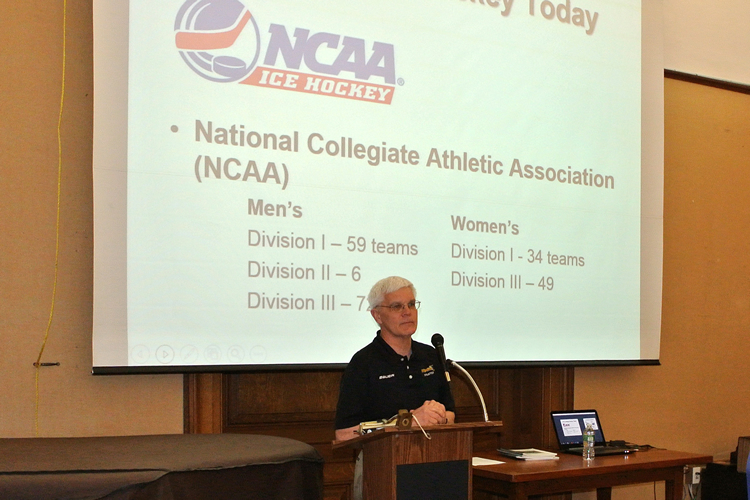 President J.-P. Martel reported that the Hockey Origins Research Group had entered 260 references to stick-and-ball games, dating back to the 13th century, into a database on the SIHR website. 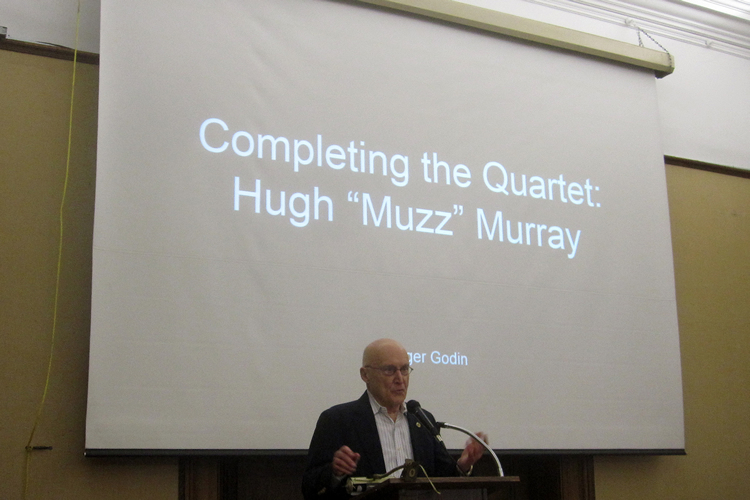 He read a thank you letter from Dale Morrisey, who produced a film on hockey pioneer James Sutherland, for the $1,000 grant SIHR authorized at the 2012 AGM. 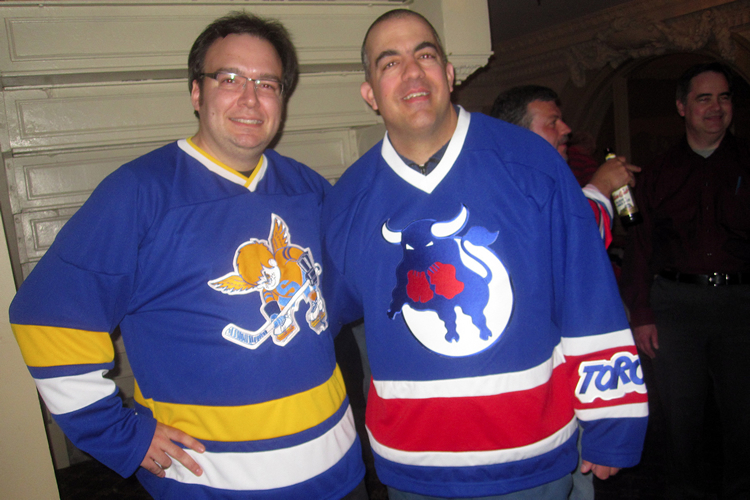 The Quebec chapter has held two successful meetings, in Montreal and in Quebec City. Secretary Lloyd Davis reported that membership is roughly the same as last year and that SIHR's Facebook and Twitter accounts have healthy followings (nearly 250 and more than 400 followers, respectively). A Special Projects Committee, tasked with drafting guidelines on funding hockey research-related projects, recommended that SIHR funds would instead be best applied towards raising the Society's profile. Webmaster James Milks reported he had looked into the online streaming of meetings and found that, under the right circumstances, proceedings could be "webcast," although the least expensive option entailed a 90-second delay. Executive VP Paul Bruno was chosen to head the Awards Committee authorized at last fall's meeting. SIHR's online statistical database keeps on growing, with more than 1.1 million lines of data, 194,000 players, and 54,000 photographs. Progress has been made towards a revamped SIHR constitution. Committee chair Len Kotylo was optimistic that a draft could be presented to the members at the fall meeting, and no later than the next AGM. 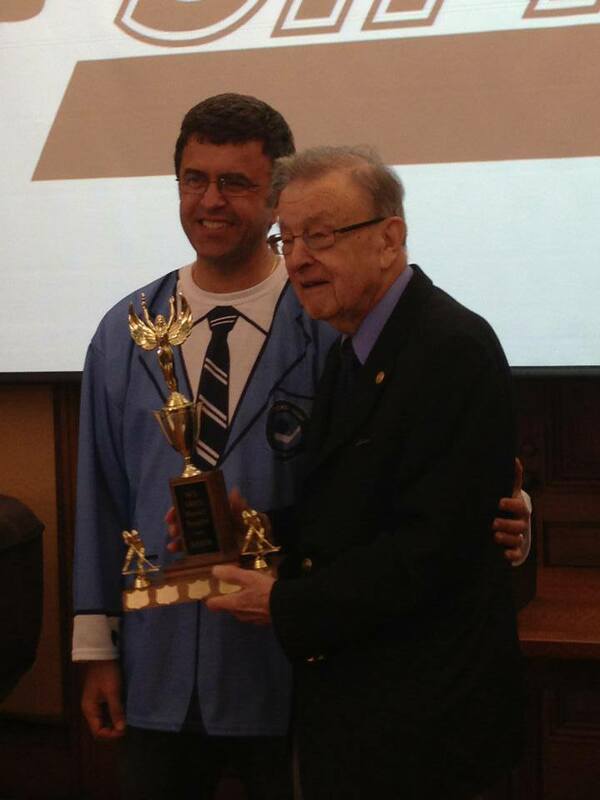 Earl Zukerman, SIHR's VP Quebec since its inception, stepped down after 22 years of service. In his place, Benoit Clairoux was acclaimed, as were secretary Davis, treasurer Iain Fyffe, VPs Ron Leger (Atlantic), R.J. Pratt (Canada West), Jim Mancuso (USA East), Roger Godin (USA West), and directors-at-large James Milks (Canada) and Patrick Houda (international). Wayne Geen was nominated for VP Ontario, necessitating an election, in which Geen was chosen over incumbent Bob Duff. The Brian McFarlane Award for outstanding research and writing goes to Marc Durand of Stoneham, Que., while Wilbrod Despres of Gaspé, Que., and R.J. Pratt of Calgary, Alta., received the President's Award for contributions to the Society. 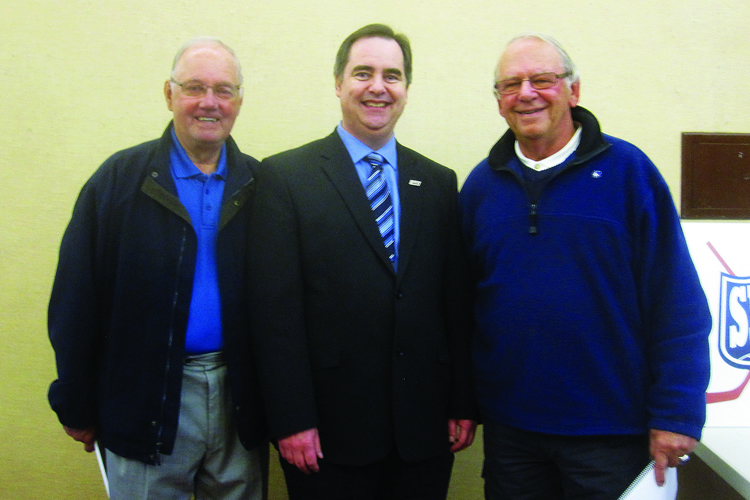 Penetanguishene-Midland, Ont., was chosen as the site of the 2014 AGM. Waxy Gregoire will play host. A resolution was passed that SIHR reexamine depositing its archival materials at an appropriate institution, and that the executive form a committee to do so. The abbreviation SIRH (SociÃ©tÃ© internationale de recherche sur le hockey) will be used in SIHR communications in the French language, and $100 was authorized to be spent on appropriate signage. A committee, to be chaired by Paul Patskou, will represent SIHR in discussions regarding the potential digitization of The Hockey News's archives. Finally, the membership voted unanimously not to audit the Society's 2012 financial statements. Lunch from Ventura's Restaurant included such Utica delicacies as chicken riggies, Utica greens and tomato pie. For the morning break, Florentine Pastry Shop supplied cannoli, pusties and sfogliatelli. Following the mid-afternoon feast, Jack Kane and Borden Smith, two players from the legendary 1967/68 Clinton Comet EHL playoff championship club that had a regular season record of 57-5-10 (.861), spoke about their hockey careers. Kane is the Comets regular season all-time leader in points and assists whose EHL regular season rank in points is fourth (972) and assists is third (639). Smith is the Comets regular season all-time leader in goals whose EHL regular season rank in goals is fourth (408). Unfortunately, three other stars from that great Clinton squad who were also going to speak, Ian Anderson, Dave Armstrong and Pete Prevost, were unable to attend. 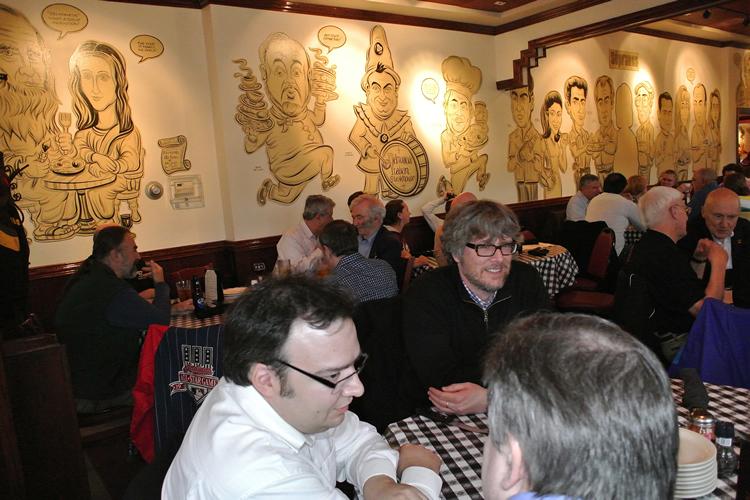 On Saturday evening, there was a group dinner at Delmonico's Italian Steakhouse ("Home of the 24 oz. 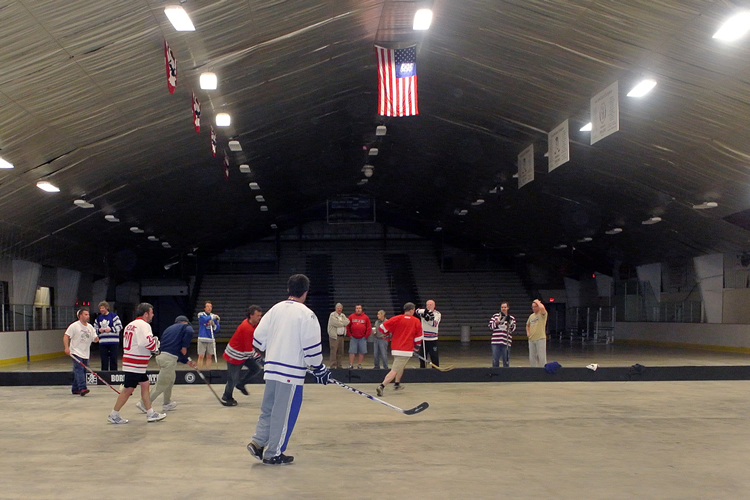 Certified Angus Delmonico Steak") and a ball hockey game at the New Hartford Recreation Center in New Hartford, N.Y. Team Martel defeated Team Bruno, 15-11, in a "first to score 15 wins" game in the first Fitsell Cup match ever played in the United States. In keeping with SIHR tradition, the night was capped off by lounging in the "Maritime Room" at the host hotel (Steve Leblanc's, Ron Leger's and Doug Pottie's quarters), but this time everyone was in for a special surprise. 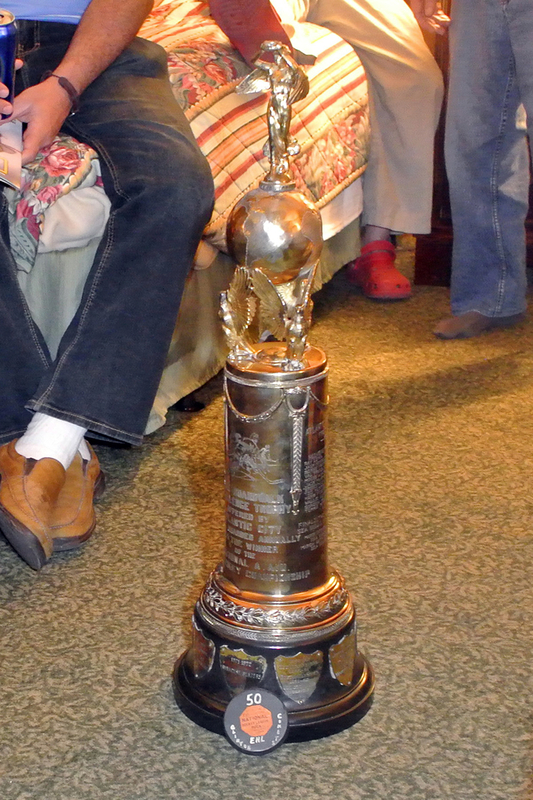 Craig Campbell of the Hockey Hall of Fame brought the Atlantic City Boardwalk Trophy with him and showed off the hardware in the "room that never sleeps" for several hours. The Boardwalk Trophy dates back to 1931, was competed for in every EHL season from 1933 to 1973, and had significance locally in the Utica area since the Clinton Comets won it for capturing their first Eastern League playoff crown in 1959 and four consecutive North Division titles from 1967 to 1970. 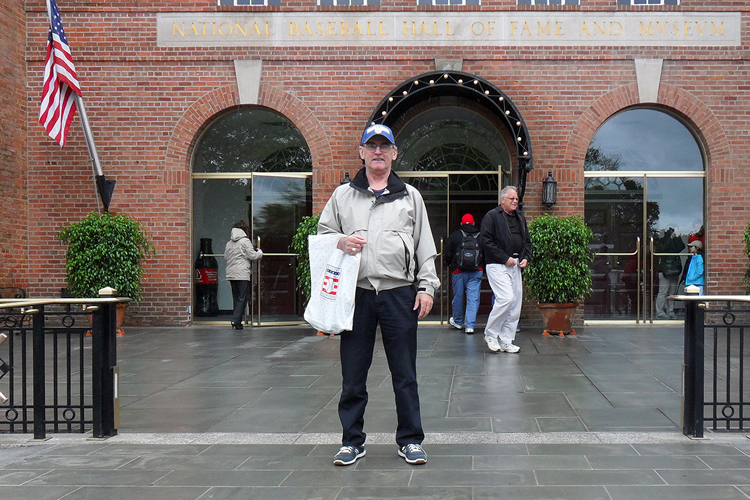 On Sunday, many SIHR baseball buffs travelled to Cooperstown, N.Y., to tour the National Baseball Hall of Fame and Museum and explore the rare baseball and sports memorabilia items in the stores along Main Street. It was fitting to wrap up the Society's first AGM in the U.S. in the place where its first-ever U.S. meeting (the 1995 fall gathering) took place. Despite a slight nip in the air, SIHR members received the warmest of welcomes as the fall meeting was staged in Renfrew, Ont., over the weekend of Oct. 25 - 27. Executive VP Paul Bruno echoed the sentiments of all 30 in attendance when he said he couldn't remember the last time a group was as excited about hosting a SIHR meeting as the committee led by member Frank Cosentino. 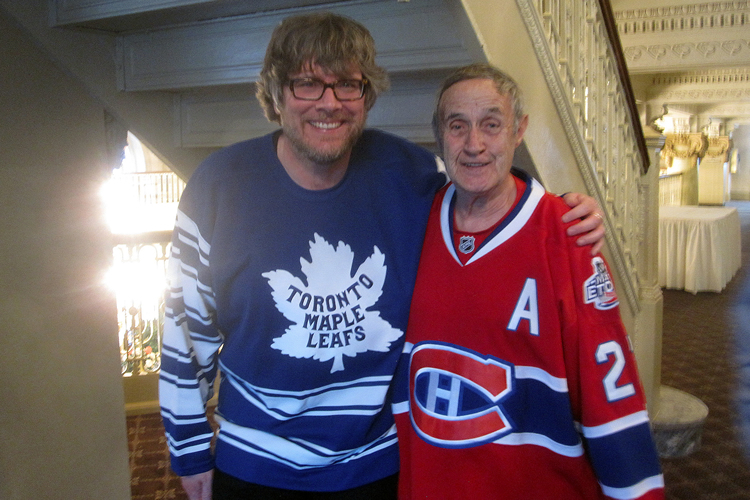 Frank was ably assisted by an all-star lineup that included, among others, former mayor Sandi Heins; town councillor Jim Miller; the executive director of Renfrew's NHL/NHA Birthplace Museum, Ray Dunbar; and museum board chair Bob Barker. Birthplace Museum, Ray Dunbar; and museum board chair Bob Barker. For 15 members, the weekend began about 100 km down the road in Gatineau, Que., with a tour of the Library and Archives Canada Preservation Facility and a visit to the Canadian Museum of Civilization. In Renfrew, the staff of Scapa proudly showed off their factory, where the lion's share of the world's supply of hockey tape is made. Next up, a quick trip downtown to the NHL/NHA museum, where the meet-and-greet was held among the exhibits. Membership stood at 535, a net gain of two from the year before. 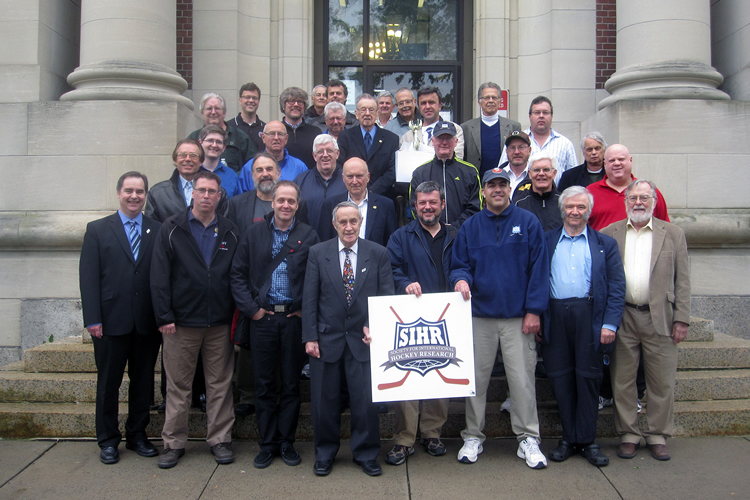 Signage bearing SIHR's French name and abbreviation (Société internationale de recherche sur le hockey, or SIRH) was unveiled. Treasurer Iain Fyffe's report stated that he was at work preparing a manual for future treasurers, and that the coming year would bring a focus on formal budgeting. His report was not accompanied by a financial statement. Although SIHR's constitution does not require a second statement to be presented at fall meetings, the consensus was that it should be done. Iain was tasked with preparing a statement, which has been reviewed and deemed satisfactory by the board of directors. Copies will be distributed to members. The board of directors. Copies will be distributed to members. James Milks reported that the player database on SIHR's website continues to grow at an impressive pace, and contained records for 207,000 players, 24,000 teams and nearly 1,700 leagues. 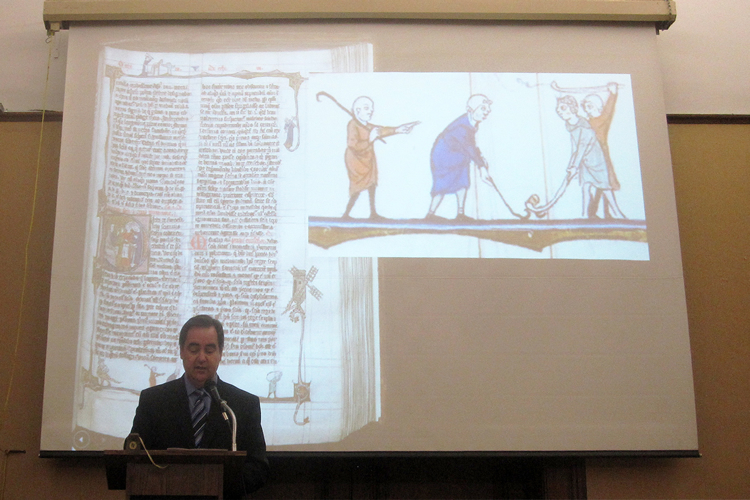 He later provided a preview of the redesigned SIHR website. On behalf of the constitution committee, Lenard Kotylo announced that two drafts for a new SIHR constitution had been completed, and the second had been circulated to committee members and was under consideration. Paul Kitchen provided an update on the proposed Stanley Cup monument, to be erected in Ottawa. The budget had been scaled back from $7 million to $4.5 million, but the goal remains to unveil the monument on March 18, 2017, to mark the 150th anniversary of Canadian Confederation, the 125th anniversary of the Cup, and the centennial of the NHL. Sherbrooke, Que., home of the QMJHL Phoenix, was announced as the site of the 2014 fall meeting. 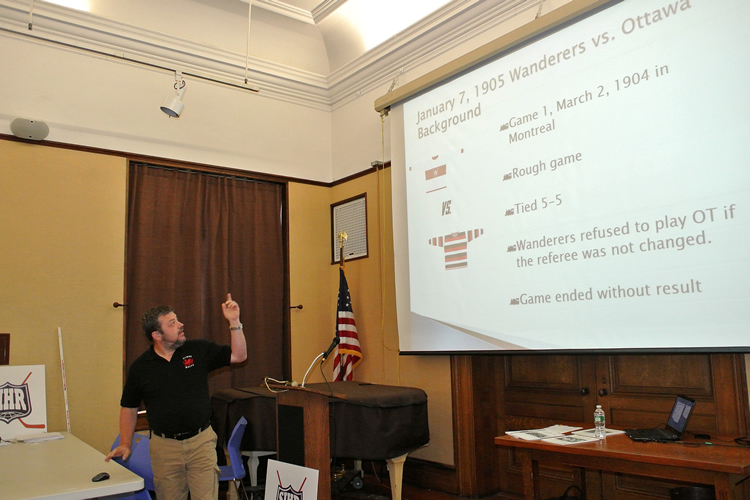 Richard Bendell of Welland, Ont., gave a detailed presentation on the 1972 Summit Series, entitled "The Series We Thought We Knew." 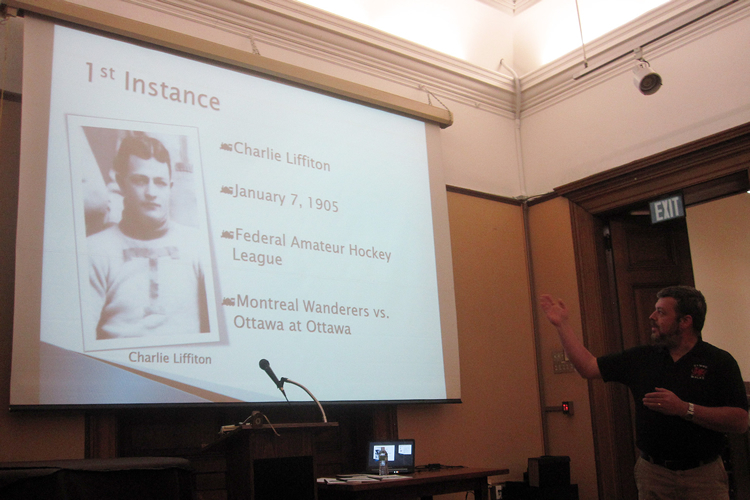 Taking several pages from his new book The NHL: A Centennial History, D'Arcy Jenish gave an entertaining talk about the economic basket case that was the NHL in the 1970s. 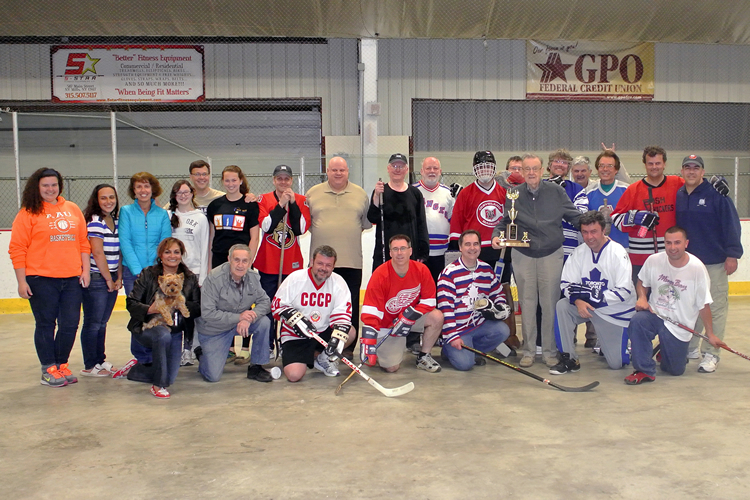 After a dinner at the Delicious Restaurant (no misnomer there), members were shuttled to the Ma-Te-Way Centre for a hockey game between the Renfrew Millionaires and the team from Eganville. Those averse to the cold socialized and kept tabs on Hockey Night in Canada in the arena's bar. Back at the hotel, a busy day was concluded with Jean-Patrice Martel's evening presentation, Hockey Movie Firsts, and some additional Summit Series info from Richard. Sunday morning, SIHR members took it to the streets - "it" in this case being the Fitsell Cup. Some of the players from Saturday night's game formed the opposition. Yours truly was seconded to their team, making it the closest I may ever come to being a Millionaire. The predominantly SIHR team prevailed by an 11 - 7 margin, and as usual, a splendid time was had by all.